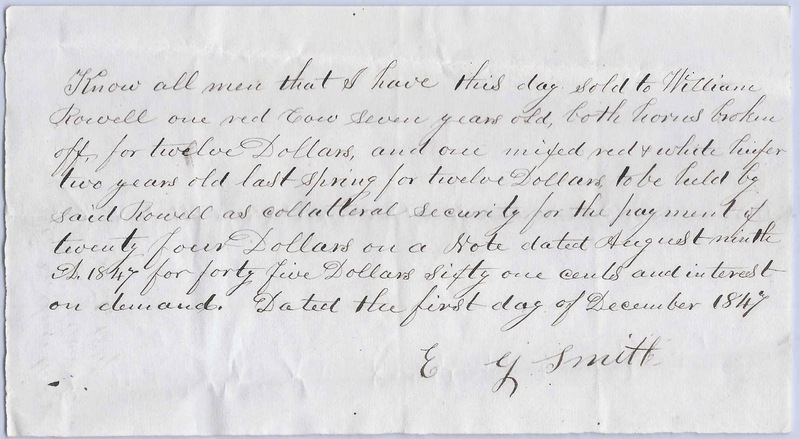 1846 document in which Eliphalet Gillette Smith of Moscow, Maine, details the livestock he sold to William Rowell, to be held as collateral security for the payment on his account. The document notes that Wellington Smith took delivery of the livestock. I believe that Wellington Smith was Eliphalet's older brother, but I'd like confirmation of that. Know all men that I Eliphalet G. Smith of Moscow have this day sold to William Rowell one pair red and white oxen five years old, one red cow four years old, and one sorrel gray horse nine years old, to be held by said Rowell as collateral security for the payment on demand of Seventy five Dollars on account. I hereby certify that I took the delivery of the within named stock for the within named Rowell. The signature, presumably of Wellington Smith, and the day of the delivery, are not present; perhaps this note was a copy for Eliphalet Gillette Smith's records. The second document is dated 1 December 1847 and concerns the same Eliphalet G. Smith and William Rowell. This document does not mention Wellington Smith. Know all men that I have this day sold to William Rowell one red cow seven years old, both horns broken off, for twelve Dollars, and one mixed red & white heifer two years old last Spring, for twelve collars to be held by said Rowell as collateral security for the payment of twenty four Dollars on a Note dated August ninth 1847 for forty five Dollars Sixty one cents and interest on demand. Dated the first day of December 1847. Eliphalet Gillette Smith was born 28 October 1820, I think at Litchfield, Maine, the son of Samuel Smith and second wife Rhoda (Russell) Smith. I believe his paternal grandparents were Thomas and Mehitable (Baker) Smith, and his maternal grandparents were Joseph and Elizabeth (Goodridge) Russell. There were several online trees that mentioned the children of Samuel and Rhoda but none that included a Wellington Smith, who was born 9 November 1818 at Moscow, Maine, of Samuel and Rhoda Smith, according to a birth record I found. It's possible that his father was another Samuel Smith who just happened to marry a Rhoda. Eliphalet Gillette Smith married twice, first to Anna Ward Steward, daughter of Thomas and Apphia (Williamson) Steward, with whom I think he had five daughters: Sarah, Julia, Marie, Lucy Adelaide and Eveline. Anna was born about July 1921 at Bloomfield, Maine. She died 2 February 1858 at Moscow, Maine, perhaps as a result of Eveline's birth. Eliphalet next married Sarah Emiline Anderson, daughter of Alexander and Sarah (Bulley) Anderson. Sarah was born at Cardridge [? ], New Brunswick about April 1834. I believe Eliphalet and Sarah had at least two children, sons Alfred and Samuel. Sarah died 7 August 1907 at Manchester, New Hampshire, where she had made her home with son Alfred. Eliphalet Gillette Smith died at Bingham, Maine, on 12 October 1881. Wellington Smith was born at Moscow, Maine, on 9 November 1818, son of Samuel and Rhoda Smith, perhaps Samuel and Rhoda (Russell) Smith. A reader speculates that he may have been Thomas Wellington Smith, who went by his middle name. He married Mahala Longley or Langley, daughter of Samuel Longley and Elizabeth Pierce, at Moscow, Maine, on 17 April 1841. Mahala was born abut 1822 at Bingham, Maine, and died on 24 July 1912 at Augusta, Maine. Wellington and Mahala later lived at Gardiner, Maine, and Augusta, Maine, according to the 1850-1880 Censuses, where Wellington worked in the lumber industry. They had at least five children: Flavilla, Olney, Henry, Flora and Frank. Wellington died on 23 April 1890. William Rowell was born 25 Jun 1798 at Madison, Maine, son of David and Sarah (Spaulding) Rowell. He married Lucinda H. Fletcher on 11 June 1833. Her address at the time of her marriage was Milburn, Maine, an earlier name for Skowhegan. I haven't yet determined if Fletcher was her maiden name. If you have the names of her parents, please leave a comment or contact me directly. By 1860, according to the US Census, William Rowell was a bank president at Skowhegan, Maine. William and Lucinda had at least two children, daughters Harriet Frances and Helen Maria. Harriet, born in 1833, died in 1844. Helen Maria married Russell Benjamin Shepherd, son of Job M. and Betsey (Richmond) Spepherd. He was born at Fairfield, Maine in 1829 and served as an officer in the Civil War. He rose to the rank of Brevet Brigadier General. Eliphalet was born the 28 Oct according to FindaGrave. Thanks for the birth day for Eliphalet! Interesting about Thomas W. - that could be it.